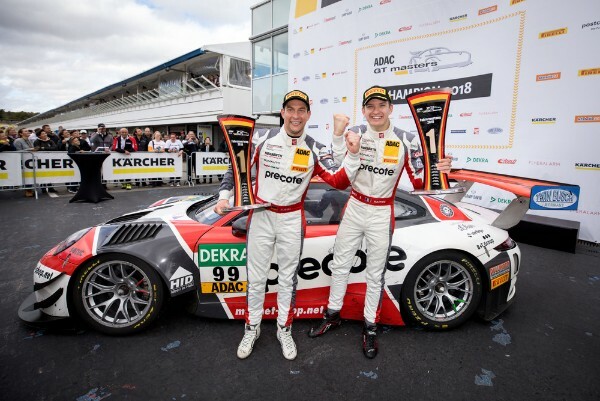 Robert Renauer (33, DEU) and Mathieu Jaminet (24, F, both Precote Herberth Motorsport) secured the ADAC GT Masters title exactly 50 days ago today. The Porsche drivers look back on their year, tell us of their experiences in the dramatic season finale at Hockenheim and look ahead to 2019. What’s it like being an ADAC GT Masters champion? What significance does winning the title have for you? The finale weekend at Hockenheim was very dramatic. How was it for you? No doubt, a lot of people wanted to congratulate you after the finale. Did that bring any big surprises or did anyone congratulate you that made you particularly pleased? Looking back, what was ultimately the key to your title win? Was there a race or a weekend where nothing really worked? Things were pretty evenly matched all season, but looking back, who were your toughest opponents in the title fight? Have you got any firm plans yet for 2019? Will we see you pair, sporting start number 1?